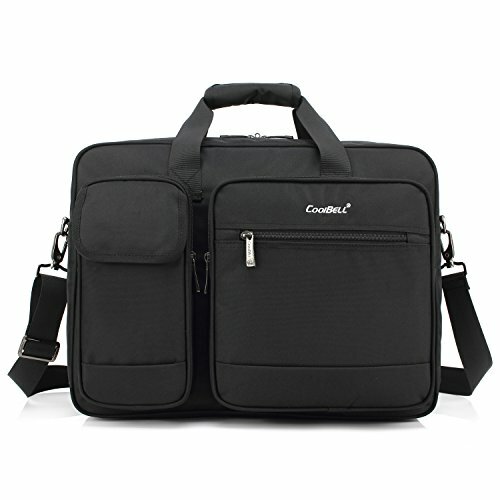 Fits laptop brand like Dell / HP / Toshiba / Lenovo / Acer / Macbook / SONY / ASUS which up to 17.3 inches. Size: 17.7 x 13.7x 5.5 inches; Fits up to 17.3 inches laptop. Warm Tips:Thanks for your purchasing in our store! Please do not worry about the no poisonous material smell with the bag when you receive it, the smell will disappear in a airy place for a while. Bag Interior Size:17.3*11.8 inch;Exterior Size:17.9*13.4*5.7 inch Multi-functional compartments.Laptop compartment with strengthened shockproof foam padding to protect the 17 inch laptop.Accessary compartment with functional pockets inside for keeping power cord, mouse, books papers etc. Three front pockets design. left side pocket for storage of a phone; right side pocket for keeping an iPad mini or notebooks. Back pocket with two zippers. Provides the function of keeping items and fixing the bag to trolley of a luggage case. Convenint design. Versatile----Personalized good looking appearance, ideal for?daily use at school, work, weekend, outdoor holiday, outdoor activities, occasional travel, gyms, hiking, biking etc. Nice size admirably suits college students, teen girls boys and adults.